Inwood Ice Arena is located at 3000 W. Jefferson Street and is part of the Inwood Athletic Club complex. 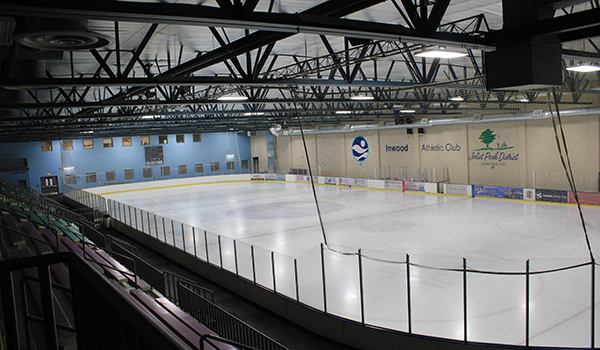 With a full size (200' x 85') sheet of ice and seating for 1000, the ice arena hosts a number of hockey and figure skating events throughout the year, including the annual NIHL youth hockey tournament and Inwood Skate School Ice Show and Fire & Ice Competition. The Inwood Ice Arena is open to the public. Notice: Due to periodic special events, we may change our scheduled daily activities on short notice. Please call 815.741.7275 ext 305 to confirm dates and times. For Ice Rental Rates and Rental Information call Dan Hinz at 815-741-7275 ext. 118. During Public Skate, groups of 20 or more are $4 per person, skate rental additional. Special rates for school field trips and youth civic organizations are available! For more information about private ice rentals and group rates, contact Dan Hinz at 815-741-7275 ext. 118. Have your party here! Our party package for 10 people includes 2 hours of in our party room, public skating, skate rental, a party host, 2 large pizzas, 2 pitchers of pop and a gift for the guest of honor. Additional fees may be required for additional guests, food or beverages. Parties are available during Public Skating Sessions. Call ext. 118 for details.